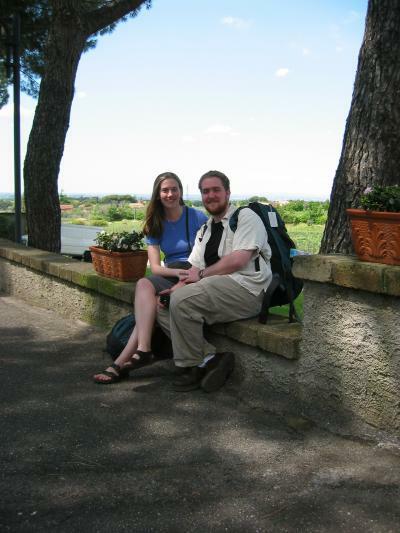 April 24-27, 2004 - We decided to spend a long weekend in Rome and had a wonderful time! We left Stansted airport (at 6:25am... bus from Cambridge at 4am!) to a clear sunrise and landed at Rome's Ciampino airport to rain. Since Paul, Sean, and I were traveling together, we figured it was just our luck. Thankfully the rain was sporadic and by Monday morning we ended up with terrific sunburns. 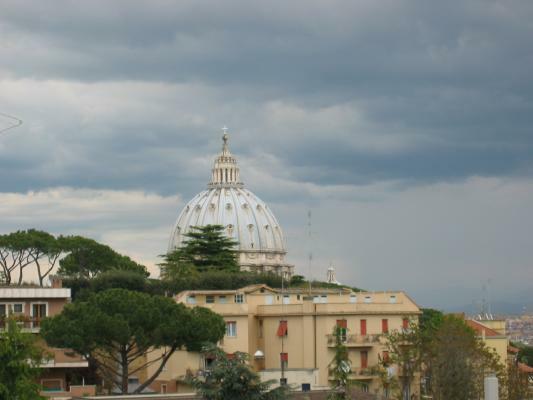 We stayed at UD's Rome campus for two nights and stayed the last night in a convent outside of the Vatican. We had an amazing time; we were able to catch up with friends and see some things that we'd never seen before. Since we all spent a semester in Rome and had seen the major "must-sees", we were free to wander without worrying that we might miss the Colosseum. 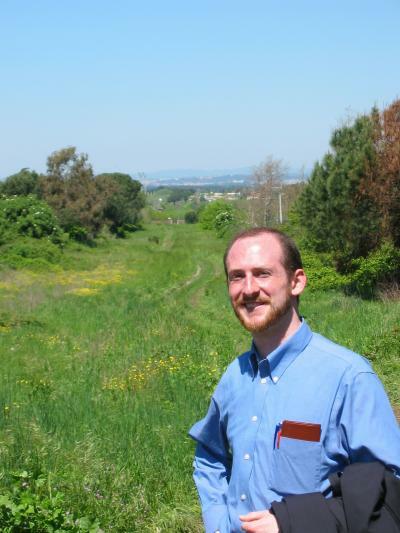 We took one turn too soon on our way to visit the Via Appia Antica near Due Santi and took a long, but sunny and scenic, walk through the countryside from Frattocchie to Santa Maria della Molle and back. 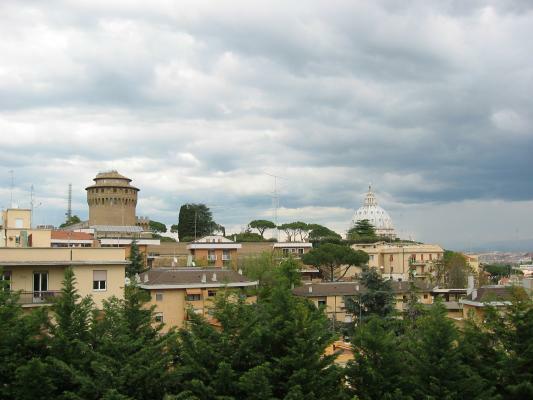 We visited Grottaferrata and Frascati in the Alban hills, two towns not far from Due Santi that we'd never had the chance to see, and we were able to visit the church of Santa Maria Antiqua in the Forum. 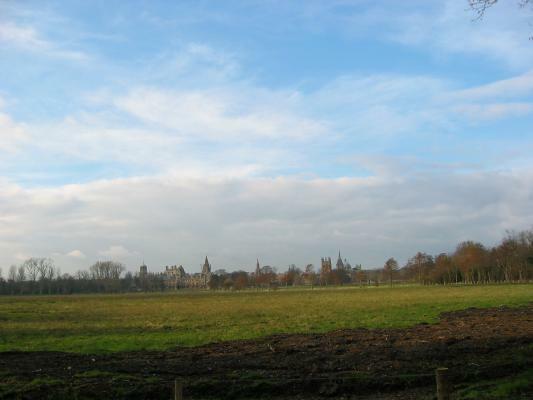 This church has been closed for many years and is open only from Easter to the end of May while it is being restored. 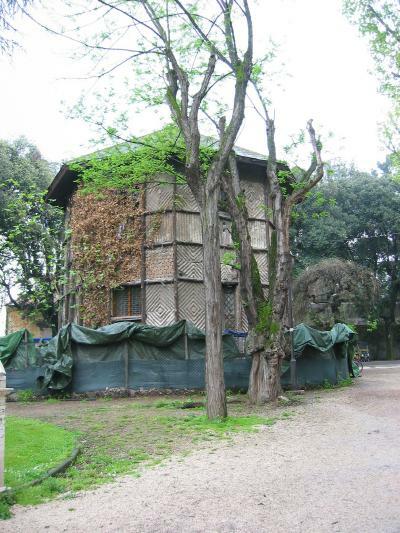 It contains Greek style paintings that can be found nowhere else in Rome. We were fortunate enough to get in for a tour with only three other people by asking at the right place and the right time. You can read more about this project here: http://www.archeorm.arti.beniculturali.it/sma/eng/index.html , since it was questionable whether picture-taking was allowed. 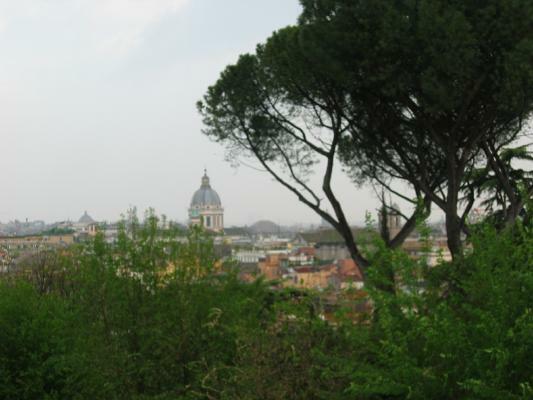 One of the first places we visited on Saturday once we'd dropped our things off at Due Santi and headed into Rome was the Borghese Gardens. 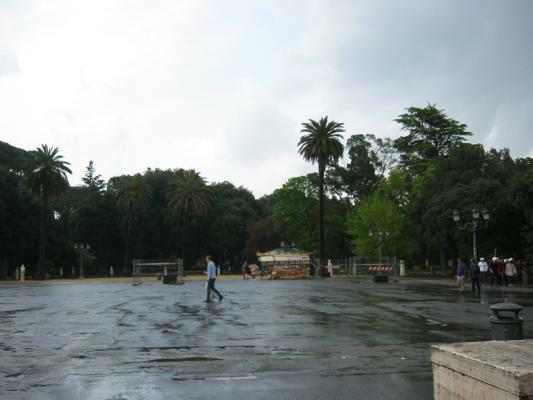 It turned out to be too late to get into the museum at the Villa Borghese, but we had a nice walk through the gardens. 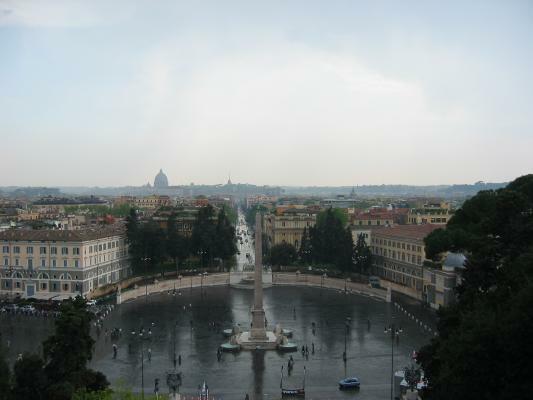 We climbed up the steps in the pouring rain and turned to look over the Piazza del Popolo (in the first picture) up the Via di Corso as the hail started. The shower ended quickly and we had the scenery to ourselves for a while. 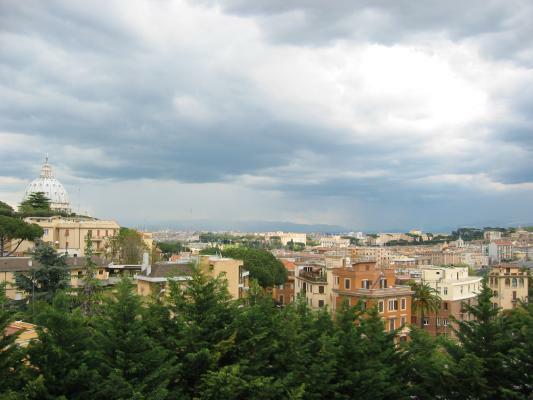 In the second picture you can see the Pantheon (it looks like "an over-turned soup bowl" in the center). 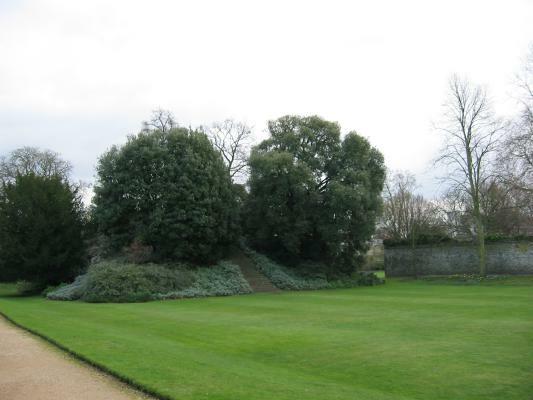 The third picture is looking back towards the gardens from the overlook ("Belvedere" = "beautiful view"). The fourth picture is a mysterious reconstruction of Shakespeare's Globe theater, which seems to be used only as a bike shed. 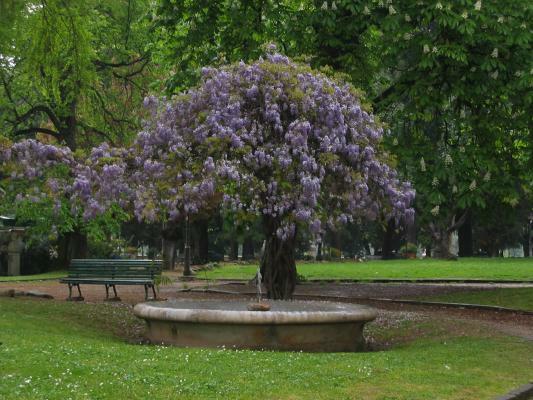 The first picture is just one of the many pretty fountains in the Borghese Gardens. On Sunday, in Grottaferrata we visited the Byzantine rite monastery of San Nilo which celebrates its 1000th anniversary this year. As per usual, it was raining too much to get a good picture. 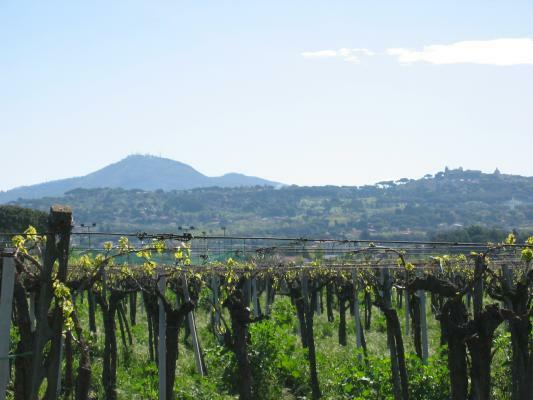 We then went to Frascati, where we discovered a few gems. Unbeknownst to us, Bonny Prince Charles is buried in the Jesuit church in the town. 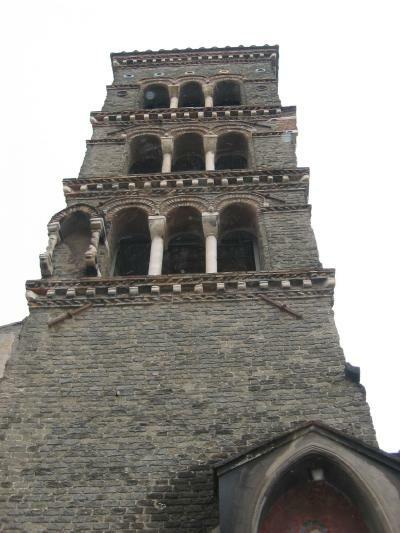 Also, we came across a campanile (belltower) which was erected in 1305. 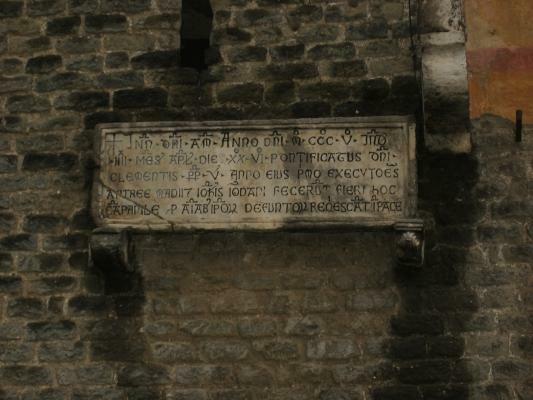 Its unusual inscription was written with many manuscript abbreviations, so Paul and Sean were able to practice their palaeography skills. 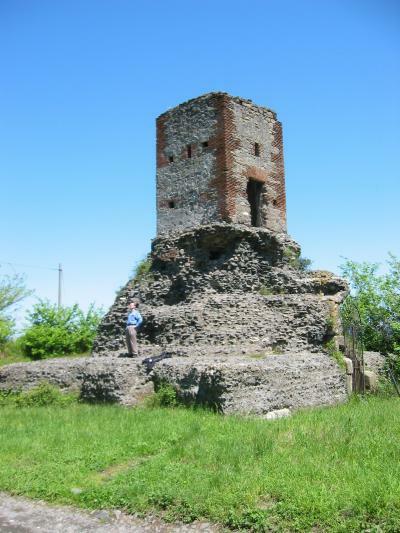 Monday morning before we went into Rome we decided to visit the remains of the Via Appia Antica near Frattocchie. A premature turn sent us on a long walk but it was certainly a beautiful day. 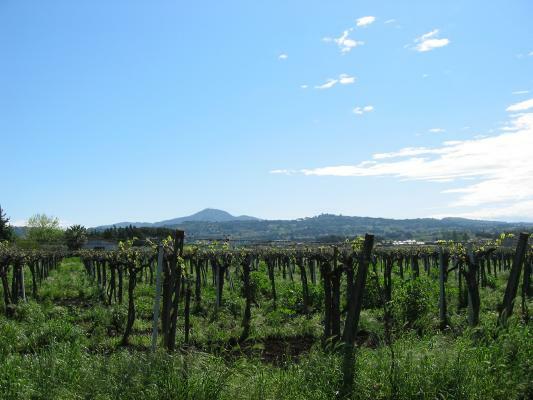 The first two pictures are looking back over vineyards towards Monte Cavo (on the left) and Castel Gandolfo (on the smaller hill to the right). Due Santi is just barely visible above the vines. 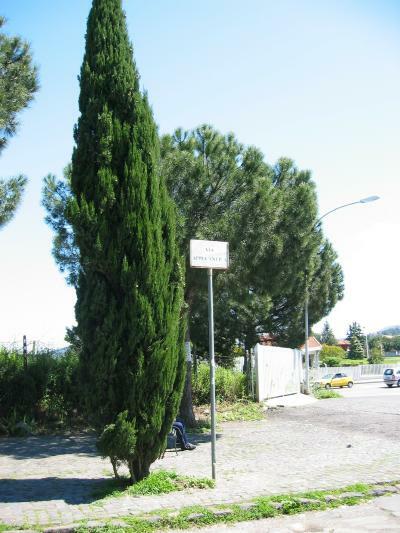 We finally came to the Via Appia at the end of where we had meant to walk, near the train station in Santa Maria della Molle. We decided to walk it back towards Frattocchie. Here Sean stands with his back to the train station. The last picture shows some of the original paving stones. 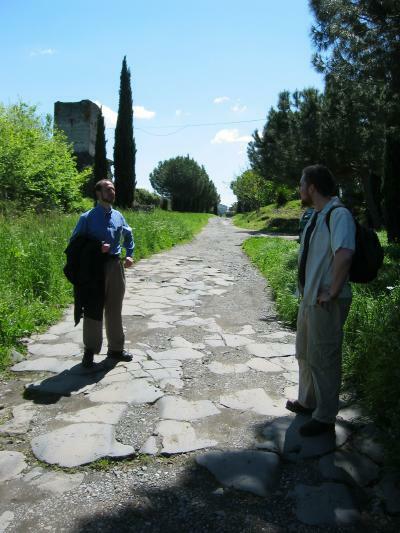 In the first two pictures you can see Paul and Sean near one of the mausoleums on the Via Appia which later had a tower built upon it. 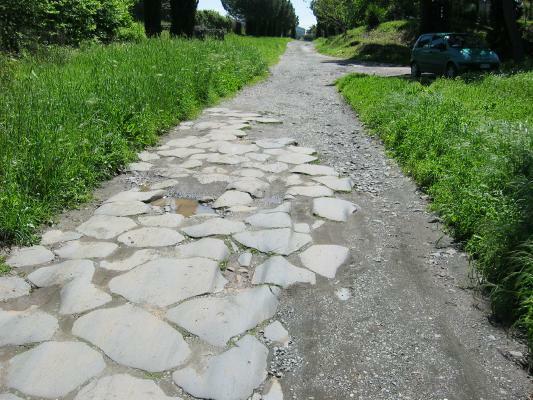 The last picture is the start of this section of the Appia, in Frattocchie. 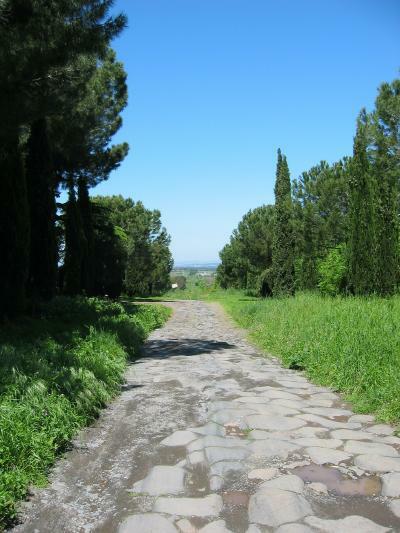 It is possible to walk all the way into Rome (the opposite direction of the way we walked), but it is a long way! Before we left Due Santi for Rome we posed for a picture to prove that we were there! The next three pictures are the views out of the window in our room in the convent where we stayed. 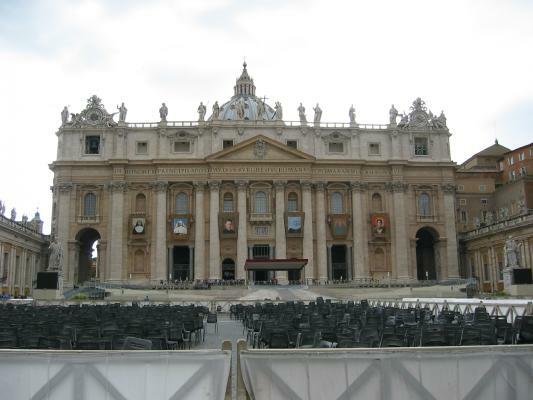 There was a beatification at St Peter's on Sunday morning and the basilica was still decorated on Monday afternoon. We did get some rain and we rushed over to the Pantheon, in the hopes of seeing the rain coming the oculus. We missed the rain (the one time we hoped to see it!) 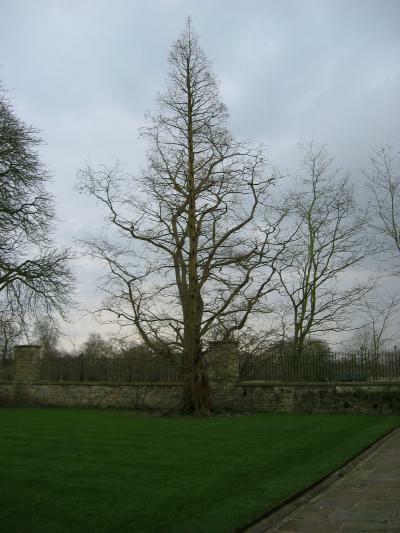 but we did hear a choir singing and then an organist try to outdo them. I did get a quick video of the Pantheon with the organ music in the background but it seems to be too large to get it on the website at the moment. I'll see what I can do.